Q. 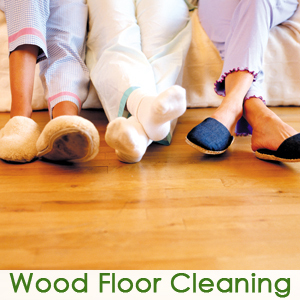 What are the different types of wood floors, and how should they be cleaned? A. The most common type of wood floors is a surface-sealed floor, sealed with polyurethane, urethane or polyacrylic. These types of floors are resistant to stains and water damage, so you can just sweep them and mop them for everyday cleaning. Penetrating-seal-treated and oil-treated floors are also common but trickier to care for, as they should be protected with paste or liquid wax. Varnish, lacquer and shellac floors are not as resistant to spills, wear and moisture. As with completely untreated floors, treat them the same way as penetrating-seal-treated and oil-treated floors. If you’re not certain of the type of floor you have, rub your finger across it. If a smudge appears, it has been treated with an oil finish, lacquer, varnish or shellac and then waxed. If there’s no smudge, the floor was surface sealed. Q. Can I use regular furniture spray, wax or oils on my wood floors? A. No! Oils can leave residue, while furniture sprays will give you a slippery surface, which is not what you want on a floor. Putting wax on is time consuming and makes it difficult to re-coat. Don’t use an abrasive cleaner or ammonia, as these products can scratch the finish or give the floor a dull appearance. Only use a special floor cleaning product that has been recommended for that particular floor. Otherwise, just use a mild soap and water. Avoid vinegar and water, as that can cause a wood floor to look dingy and it won’t remove built-up dirt. Q. How should I perform routine cleanings? A. If the wood floor sees a lot of traffic (such as in kitchens and dining rooms), try to sweep it daily and mop once or twice every week. For floor with less traffic, once every month or every season should be fine. Do not use too much water, as this can discolor and damage the wood. Use a slightly damp mop only. After cleaning with the cleaning solution, go back over the floor with clean water to give it a rinse. Q. When should I call KIWI for a professional wood floor cleaning? A. If it has been a long time since your floors have been professionally cleaned, they might have lost their original luster. If this is the case, KIWI’s wood floor cleaning specialists can restore your old wood floors so they look like new again. 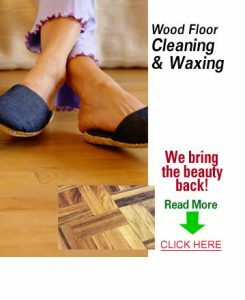 We will carefully clean and mop your wood floors by gently buffing, waxing and polishing, removing dirt and stains and bringing back the shine. KIWI is fully insured and licensed with nearly 30 years of experience cleaning wood floors. This type of deep-down cleaning can also remove caked in toxins from the floor, giving you healthier air in your home. At KIWI, we know which types of hardwoods require water or shouldn’t be cleaned with water and whether they should be waxed or not waxed. We’ll take special care of your wood floors!